Congratulations to Martin Finger, Winner of Event #21: $3,000 No-Limit Hold'em (Six Handed) ($506,764)! Another day, another tournament in the books here at the 2013 World Series of Poker. Three days ago, an astounding 806 entrants put up the $3,000 entrance fee to participate in one of the few short-handed no-limit hold'em events offered at the WSOP. After thirty 60-minute levels of poker, it was German professional Martin Finger to grab hold of the title, the bracelet, and the $506,764 in first-place prize money. The third day of play began with just 13 players left vying for the title. Among them sat three accomplished professional players who ran into unfortunate enough circumstances to bust before the final table was reached. First, Dan Kelly was the name on everyone's lips as scored his sixth cash at the 2013 WSOP with his deep run in this event. Unfortunately for Kelly, he was unable to secure a spot at the ever-elusive final table. Kelly was eliminated when the inferior ace of Matt Berkey caught up on the flop. Next to hit the rail was eight-time WSOP bracelet winner Erik Seidel. Finally, the field combined to the unofficial final table of seven when two-time WSOP bracelet winner Nick Schulman was eliminated from play in eighth place. From here, eventual-winner Finger took the top stack into the unofficial final table. That quickly changed, however, when Matt Stout took most of Andrew Dean's stack in a pocket pair vs. pocket pair confrontation before the flop. Stout took hold of the position of table captain and Dean was eliminated soon after in sixth place. 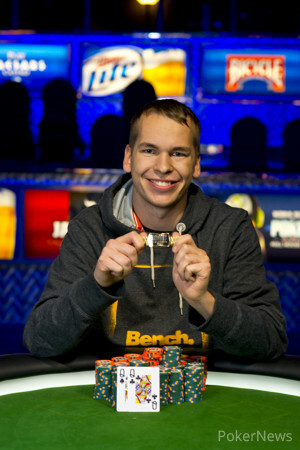 Next to fall was Nikolai Sears, who came into the final table as one of the shorter stacks. Despite a double up and getting it in as a favorite with pocket kings against Berkey's pocket tens, he was on the wrong side of lady luck and was eliminated in fifth place. 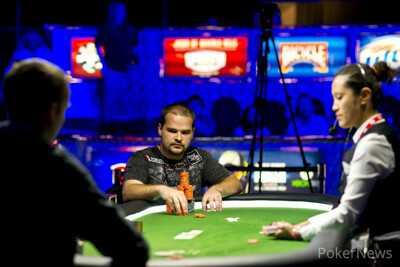 David "The Dragon" Pham became the next victim of the final table when he looked up Finger in a massive confrontation. Finger opened with a raise during four-handed play and it folded around to Pham's big blind. Pham moved in and Finger tanked before calling. The two were flipping for Pham's life and in the end it was Finger who came out on top. Berkey fell soon after in third place when he also put his tournament life on the line in a coin-flip situation. This time, it was Stout's ace-king that defeated Berkey's nines to score the knockout. Stout had a huge chip lead going into heads up play but over the course of the 98-hand match, Finger was able to wear Stout down and overtake the top position. After dozens of raise and take situations, the match finally came to a head when Stout opened with a button raise. Finger came over the top with three-bet and Stout four-bet all in for his tournament life. Finger snapped him off. The board ran out and Finger's ladies were able to hold as the best hand, securing himself as the next World Series of Poker champion. 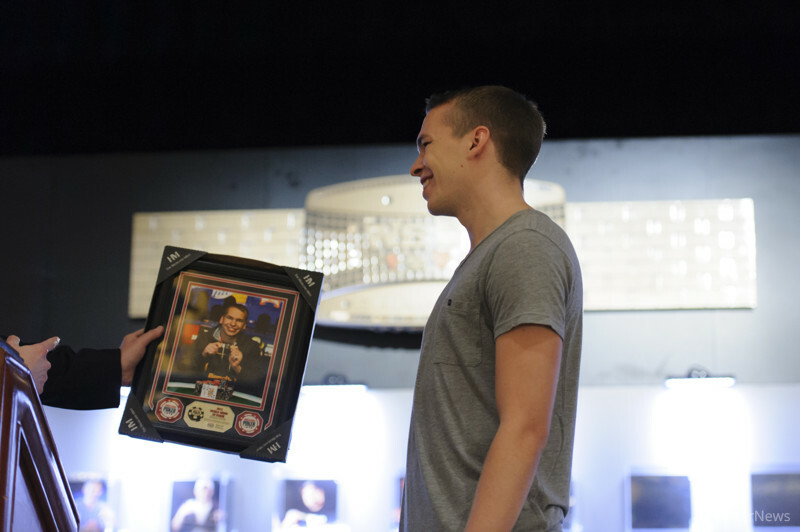 Stout was eliminated in second-place and had to wait until another day to attain his first WSOP bracelet. That does it for our coverage of Event #21! Be sure to stay tuned to our Live Reporting page as we bring you updates from all of the latest events here at the 2013 World Series of Poker! Hand #157: Matt Stout had the button. He raised to 160,000 and Martin Finger came over the top for 400,000. Stout replied by four-betting all in and Finger snapped him off. Stout was behind and in need of help going to the community cards. He did not find it, however, as the board ran out , and Finger's queens were able to hold up and secure him his first WSOP champions. Stout was eliminated in 2nd place and will take home $313,370 in prize money. Hand #149: Matt Stout raised to 160,000 and took down the blinds and antes. Hand #150: Martin Finger raised to 160,000 and Matt Stout called. The flop came and Stout checked to Finger who bet 160,000. Stout folded. Hand #151 - #153: Stout and Finger folded their respective buttons and gave the other player a walk. Hand #154 - Hand #156: Stout and Finger raised their respective buttons and took down the blinds and antes. Hand #144: Finger raised to 160,000. Stout called and the two saw a flop of . Stout checked to Finger who bet 160,000. Stout folded. Hand #145: Stout raised to 160,000 and was called by Stout. The dealer put out the flop of and both players checked. The turn was the and Finger checked. Stout bet 135,000 and Finger folded. Hand #146: Finger opened to 160,000 from the button. Stout raised to 420,000 and Finger folded. Hand #147: Stout raised to 160,000 from the button and took down the pot. Hand #148 Finger opened to 160,000. Stout called. On the flop, Stout checked to Finger who bet 185,000. On the turn, both players checked. The river was the and Stout checked to Finger. Finger made a bet of 275,000 and was called by Stout. Fortunately for him, his was good enough to take the pot. Hand #143: Stout raised to 160,000 on the button and was called by Finger. The flop came out and Finger checked to Stout who bet 160,000. Finger called. The turn was the and both players checked. The river was the and Finger decided to lead with a bet of 225,000. Stout called. Finger showed for a pair of kings, but Stout showed for a better kicker with his pair. Hand #137 - Hand #140: Each player raised their respective button to 160,000 and won the pot without contest. Hand #141: Stout raised to 160,000 on the button but quickly folded after Finger three bet to 400,000. Hand #142: Finger raised to 160,000 on the button and took down the pot when Stout folded. Hand #132: Finger raised to 160,000 and took down the pot. Hand #133: Stout raised to 160,000 and Finger called. The flop was and Finger checked to Stout who bet 160,000. Finger raised to 450,000 and Stout called. The turn was the and Finger checked. Stout put out a bet of 420,000 and Finger folded. Hand #134: Finger folded on the button giving a walk to Stout in the big blind. Hand #135: Stout raised to 160,000 and won the pot after Finger folded. Hand #136: Finger raised to 160,000 before the flop and won the pot without contest. Hand #129: Martin Finger raised to 120,000 and was called by Matt Stout. On the flop, Stout checked to Finger who bet 120,000. Stout folded and Finger scooped the pot. Hand #130: Stout raised to 120,000 and Finger folded. Hand #131: Finger raised to 120,000 and was called by Stout. The dealer put out the flop of and Stout check called an 80,000 chip bet from Finger. On the turn, Stout checked again. Finger bet 200,000 and Matt Stout check raised to 500,000. Finger just called. The river was the and Stout continued his line of aggression with a bet of 600,000. Finger tanked on it for a bit, but finally sled his cards into the muck, relinquishing the chip lead back to Stout. PokerNews Podcast Episode #159: Murder Inc.